Are you a beginner? You can cook! Let Chef Eric show you how. 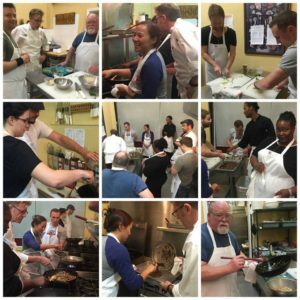 Our recreational cooking class series is great for Newlyweds, Couples, Students, and Young Adults. 4-Week Culinary Basics Series – $425 – Learn to Cook! The Culinary Basics Cooking Series is designed for the novice cook with little or no culinary experience. Starting with essential knife skills, Chef Eric will help you learn to be comfortable and confident in the kitchen. Using easy-to-prepare recipes and basic cooking techniques, you’ll learn about the importance of advance preparation to save you time and reduce stress in the kitchen. When possible, we use ingredients that can be purchased ready-to-cook to make things easier for you. This class meets once per week over a 4-week period. You will be able to create delicious and varied Meals and Dinner Parties by the end of this Series.